Millennial Voters Are Paying Attention — So Why Don't More Vote? : It's All Politics Young people showed major interest in voting in 2004 and 2008. Since then, their numbers have fallen off as the political system has become gridlocked. 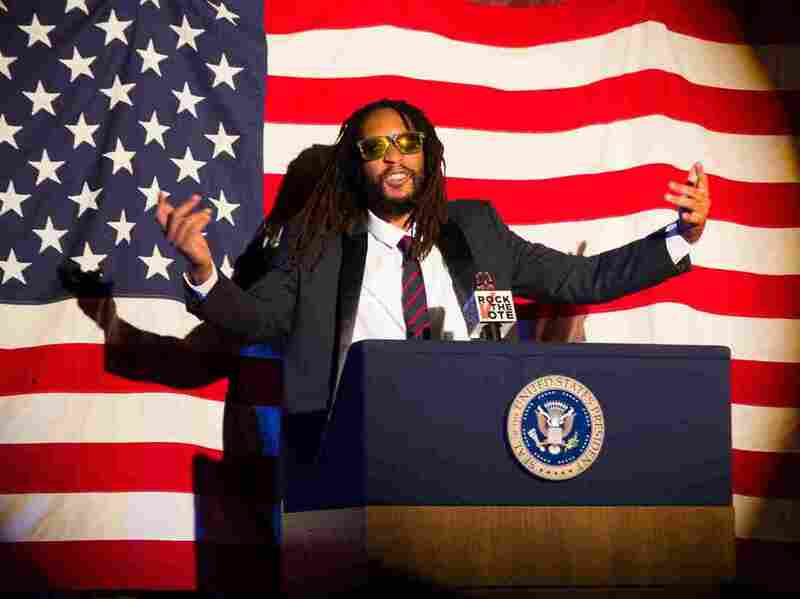 Rapper Lil Jon appears in a new ad for Rock the Vote's 2014 campaign. The organization was founded to get Generation X engaged in politics, and is adapting its tactics to reach millennials. Millennials are not getting much love from politicians this year. The big reason for that is low expectations for turnout among young voters. Back in 2010, the last midterm election, fewer than a quarter of voters ages 18 to 29 showed up at the polls. This year, it's looking even worse: 23 percent of voters under 30 are expected to vote. That's according to Eva Guidarini of the Harvard Institute of Politics, which studies young voters. Rock the Vote gained visibility in its early years with music stars like Madonna appearing in spots that aired on MTV. For many years, young voters were not expected to really care about politics, much less get involved. That's why the group Rock the Vote was started in 1989, relying on music stars like Madonna to engage their young fans. And they're still at it, with an updated set list. For a while, it didn't look like millennials would need much convincing. As more members of this generation reached voting age, participation among young voters rose. The peak year was 2008 (52 percent). In 2012, the turnout among voters 18 to 29 dropped to 45 percent. On top of that, the rate of voters younger than 30 who could say with certainty that they were registered to vote fell steadily after 2008, according to the Pew Research Center. By 2012, it hit 50 percent — the lowest number Pew has recorded going back as far as 1996. Rock the Vote's latest video message, starring rapper Lil Jon. Why the big drop? It's not like millennials aren't paying attention. Some say they're easily better informed than past generations. Jacob Bell, a 20-year-old student at the University of Maryland, put it this way: "I can pull up Facebook in front of me and see five different articles about the next Senate race, and that's something that I know my mom's generation never had." Ashley Spillane, the president of Rock the Vote, says it's no mystery why millennials, or any voters, would be turned off from the process: "Politics right now is really disheartening. I think it's why you see in the polls that young people are not affiliating with political parties." But Spillane doesn't think that means they are apathetic. "They do care very passionately about issues that matter to them," she says. "They are getting involved at a local level. They are creating startups. They are volunteering with local organizations. They are looking to take problems on in real time and fix them," she says. For Rock the Vote, the challenge is reaching a generation that's paying attention to politics — but is simultaneously repelled by what they see. While Guidarini is concerned about a generation of voters turned off by politics as they are forming their political identities, she doesn't think all hope is lost: "I think that if politics starts to change in a direction that I think all of America wants to see it change — not just young people — then you'll see young people get back in the game." The question is whether politics will improve unless a new generation gets more involved and pushes for that change.